The breakup of the Bell System was mandated on January 8, 1982, by an agreed consent decree providing that AT&T Corporation would, as had been initially proposed by AT&T, relinquish control of the Bell Operating Companies that had provided local telephone service in the United States and Canada up until that point. This effectively took the monopoly that was the Bell System and split it into entirely separate companies that would continue to provide telephone service. AT&T would continue to be a provider of long distance service, while the now-independent Regional Bell Operating Companies (RBOCs) would provide local service, and would no longer be directly supplied with equipment from AT&T subsidiary Western Electric. Feeling that it was about to lose the suit, AT&T proposed an alternative — the breakup of the biggest corporation in American history. It proposed that it retain control of Western Electric, Yellow Pages, the Bell trademark, Bell Labs, and AT&T Long Distance. It also proposed that it be freed from a 1956 antitrust consent decree, then administered by Judge Vincent Pasquale Biunno in the United States District Court for the District of New Jersey, that barred it from participating in the general sale of computers. In return, it proposed to give up ownership of the local operating companies. This last concession, it argued, would achieve the Government's goal of creating competition in supplying telephone equipment and supplies to the operative companies. The settlement was finalized on January 8, 1982, with some changes ordered by the decree court: the regional holding companies got the Bell trademark, Yellow Pages, and about half of Bell Labs. Effective January 1, 1984, the Bell System’s many member companies were variously merged into seven independent "Regional Holding Companies", also known as Regional Bell Operating Companies (RBOCs), or "Baby Bells". This divestiture reduced the book value of AT&T by approximately 70%. One consequence of the breakup was that local residential service rates, which were formerly subsidized by long distance revenues, began to rise faster than the rate of inflation. Long-distance rates, meanwhile, fell both due to the end of this subsidy and increased competition. The FCC established a system of access charges where long distance networks paid the more expensive local networks both to originate and terminate a call. In this way, the implicit subsidies of the Bell System became explicit post-divestiture. These access charges became a source of strong controversy as one company after another sought to arbitrage the network and avoid these fees. In 2002 the FCC declared that Internet service providers would be treated as if they were local and would not have to pay these access charges. This led to VoIP service providers arguing that they did not have to pay access charges, resulting in significant savings for VoIP calls. 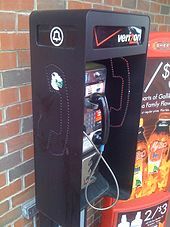 The FCC was split on this issue for some time; VoIP services that utilized IP but in every other way looked like a normal phone call generally had to pay access charges, while VoIP services that looked more like applications on the Internet and did not interconnect with the public telephone network did not have to pay access charges. However, an FCC order issued in December 2011 declared that all VoIP services would have to pay the charges for nine years, at which point all access charges would then be phased out. AT&T Inc. is headquartered in Dallas. Atlanta suburb Brookhaven, Georgia is the location of the headquarters for AT&T Mobility, formerly Cingular Wireless. The name change came after AT&T's merger with BellSouth, as well as with southeast-region telephone operations. Bedminster, New Jersey is home to the AT&T Global Network Operations Center and is the headquarters of AT&T Corp., the long-distance subsidiary of AT&T Inc. The new AT&T Inc. lacks the vertical integration that characterized the historic AT&T Corporation and led to the Department of Justice antitrust suit. AT&T Inc. announced it would not switch back to the Bell logo, thus ending usage of the Bell logo for corporate use by any of the Baby Bells, with the lone exception of Verizon. Standard Oil – The 1911 breakup of Standard Oil is often compared to the breakup of AT&T and, like AT&T, later had many "baby Standards" merge. ^ a b c d e f Tunstall, Brooke (1985). Disconnecting Parties: Managing the Bell System Break-Up, an Inside View. New York: McGraw-Hill. ISBN 9780070654341. Retrieved 14 April 2013. ^ a b "AT&T Move Is a Reversal Of Course Set in 1980's". The New York Times. September 22, 1995. ^ Jerry A. Hausman, Gregory K. Leonard & J. Gregory Sidak, 'D'oes Bell Company Entry into Long-Distance Telecommunications Benefit Consumers?, 70 ANTITRUST L.J. 463, 463–64 (2002), http://economics.mit.edu/files/1032. ^ "Business Brief -- CENTURY TELEPHONE ENTERPRISES INC.: Wisconsin Telephone Assets Purchased for $225 Million". Wall Street Journal, Eastern edition. 13 Mar 1998. p. B4. ^ Public Service Commission of Wisconsin. "Application Requirements for Requesting Certification to Provide Competitive Local Exchange Services". Archived from the original on October 30, 2014. Retrieved December 29, 2014. ^ "SBC Communications Inc.: Merger with Pacific Telesis closes, creating a giant". Wall Street Journal, Eastern edition. 2 Apr 1997. p. B, 4:3. ^ "Business Brief -- SBC COMMUNICATIONS INC.: Acquisition Is Completed Of New England Concern". Wall Street Journal, Eastern edition. 27 Oct 1998. p. B, 8:4. ^ Reinhardt, Krause (13 Oct 1999). "SBC-Ameritech No 'Baby' Bell As Giant Telecom Firm Forms". Investor's Business Daily. p. A06. ^ Cronin, Anthony (2 Dec 2005). "SBC dumps its newer letters for AT&T's old one". Knight Ridder Tribune Business News. p. 1. ^ "AT&T Inc. Closes $85 Billion Acquisition Of Bell South Corp". FinancialWire [Forest Hills]. 3 Jan 2007. p. 1. ^ "Bell Atlantic, Nynex merged". Electronic News (43.2181). 18 Aug 1997. p. 80. ^ Elkin, Tobi (26 June 2000). "New Verizon plans print to usher in merged unit". Advertising Age (71.27). p. 28. ^ Ravana, Anne (17 Jan 2007). "FairPoint buys out Verizon operation". McClatchy - Tribune Business News [Washington]. p. 1. ^ "Frontier CEO Says Telco In Strong Shape After Verizon Deal". Telecommunications Reports (76.20). 15 Oct 2010. p. 13. ^ "Qwest closes US West merger". Global Telecoms Business (Jul/Aug). 2000. p. 49. ^ "CenturyLink Merges with Qwest". Wireless News. 6 April 2011. ^ U.S. District Court for the District of Columbia (28 February 1983). "United States v. American Tel. and Tel. Co., 552 F. Supp. 131 (D.D.C. 1983)". Steve Coll (1986), The Deal of the Century: The Breakup of AT&T, New York: Atheneum. This page was last edited on 3 February 2019, at 19:48 (UTC).